Your “NAME” is the most sweetest sound in any language. Everyone likes their names ( well there are exceptions, of course). The same is the reason people name their “homes” after their own name, the shops’ after their own names, and if not the streets and cities as well based on the popular person in that location. When you’re naming a new hospital, there is always a debate to name it with politician “x” or “y”. Such is the importance of a name! On a lighter note, every one loves their “loved ones” name as well. You would like your finances name, or your wife’s name etc., To keep her/him close to your heart, one easy way is to wear the most favorite piece of jewelry, that is the ring — with your loved ones’ name. This not only makes him/her unique, she/he will always feel loved, when their names are closer to your heart. Names, are just the beginning, it could be some secret message that you share as well that can be engraved or etched on your ring. The idea is to keep the ‘love’ close to your heart! Though many offline stores have hundreds of ring designs in gold and diamond, you can’t find name rings in many jewel showrooms. There are multiple problems here. The retailers wouldn’t be able to stock rings with your name, so you would not get a clear idea on how its’ gonna look like. 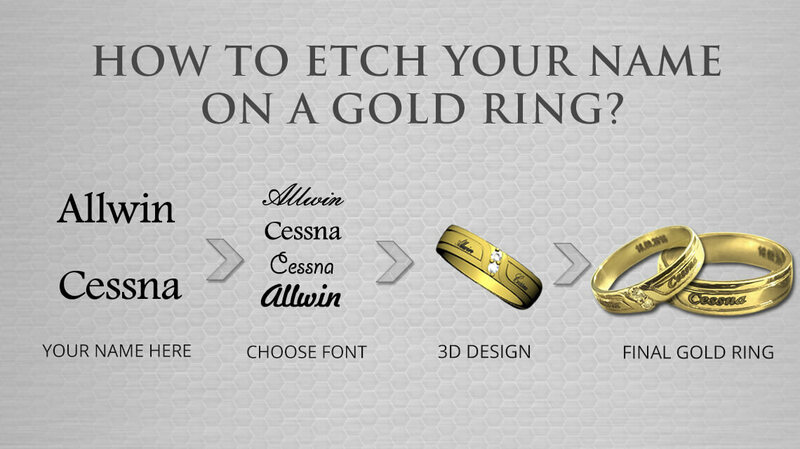 With the advancement in technology, you might want to try with a lot of fancy fonts to be engraved on the rings. You may want to choose the ring of your choice and just add the name in it. None of these customization is possible or rather easy in a traditional jewelry store. However, when you choose to buy such a unique rings for your engagement/wedding from an Online vendor, like us, we will help you visualize the final product. And, we make it easy for you to buy the ring of your choice! HOW TO GET YOUR Name RING IN ONLINE? A. 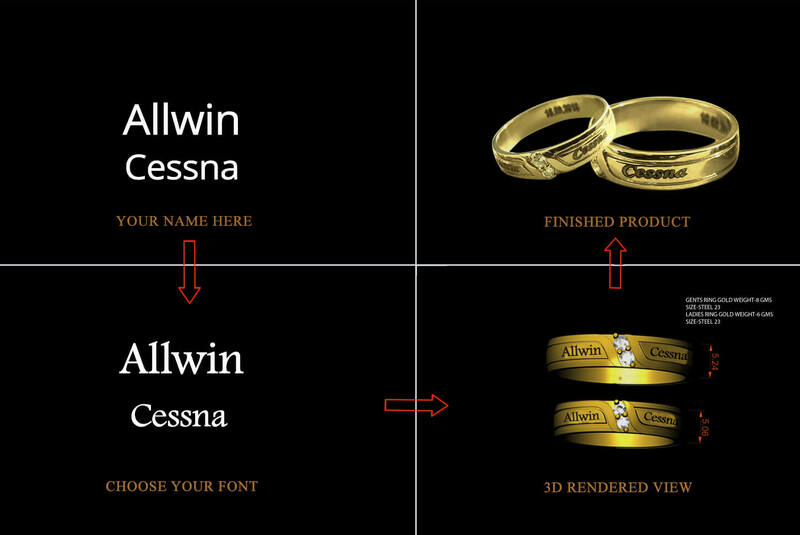 Choose the ring design. It could be a simple band to a complicated diamond ring. B. Choose the ring size and the metal you want on. It could be 18K Gold, 22K Gold Ring or a Silver ring. Choose the names you’d like to engrave/etch. Choose the color of the name to be etched, it could be either of black, chocolate brown, navy blue, pink, yellow or red. Choose the appropriate fonts that you want to engrave the text on. Augrav will send the 3D model with your required specifications. Once you finalized on the design, you are good to go. Just relax for the next 5-6 days and you will be having brand new name engraved rings ready! 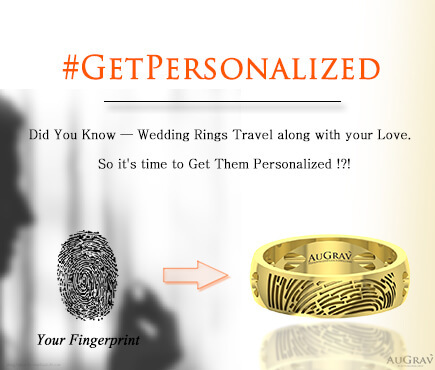 Get Your Name Engraved Rings For Your Wedding/Engagement. How To Get Name Engraved Rings For Your Wedding/Engagement? - A Perfect Guide Overall rating: 4.7 out of 5 based on 235 reviews.